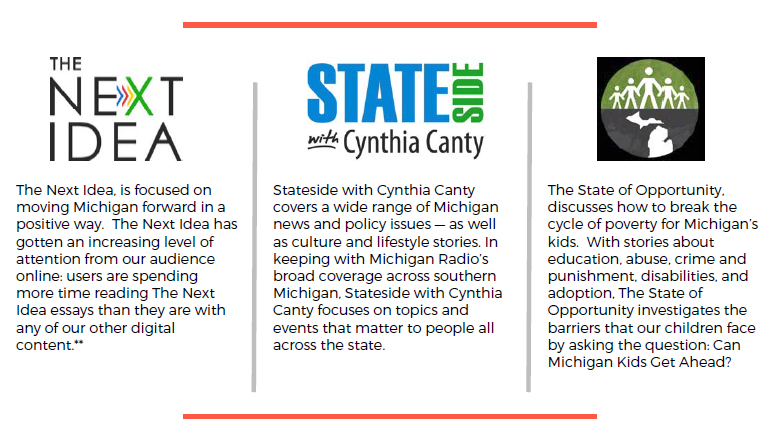 As a Michigan Radio Sponsor, you’ll reach the most coveted of audiences available: discerning, affluent, educated, engaged. 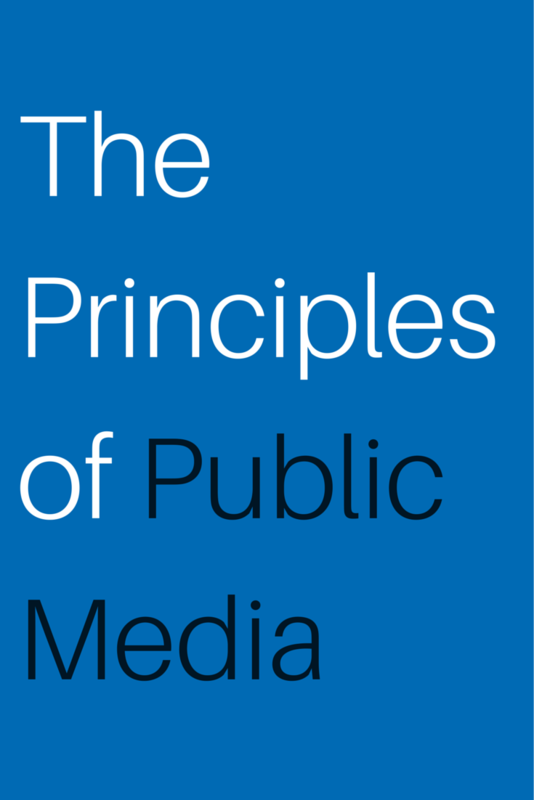 Perhaps more importantly, you’ll reach that audience where YOU are doing business. 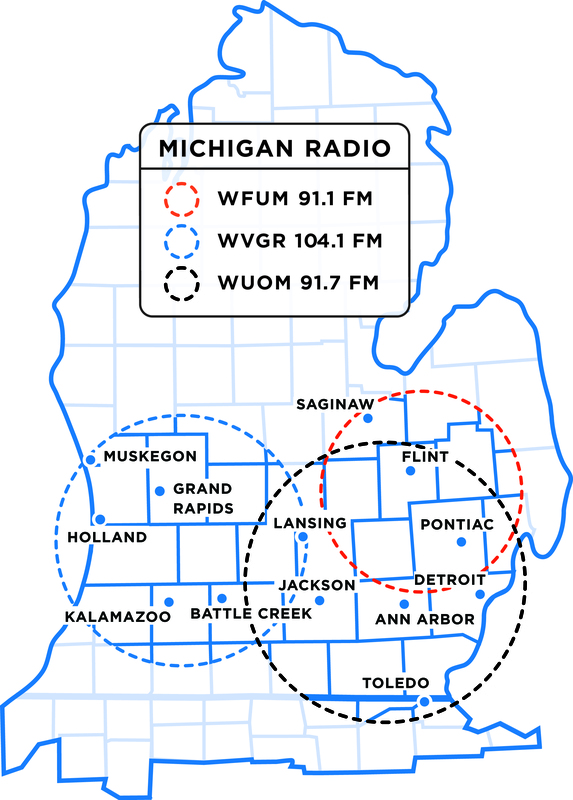 Michigan Radio’s listening area reaches all of southern Michigan, from coast to coast. If you are doing business in Michigan, we have the audience for you, with our signal reaching 80% of the population of the state! Contact us to find out more about how you can reach the right audience in the right area to build your brand awareness! In the rapidly changing industry, it is essential to build relationships with decision makers at businesses that are seeking insurance solutions that you can provide. In fact, our listeners are 98% more likely than the average American to be the purchaser of insurance at their place of work, and with 53% of listeners obtaining their medical insurance from their places of work, reaching out directly to individuals looking to purchase policies in the healthcare marketplace is essential to diversifying your client base. In Addition, The Affordable Care Act has increased the number of people with insurance, but many of the newly insured have Medicaid or Medicaid HMO plans, which have a lower profit and higher rate of claim. NPR listeners are 67% more likely than the average American to have a traditional fee-for-service health plan and half as likely to have Medicaid, meaning that you can sell your high quality insurance services to those who are looking for just that. Michigan Radio can reach the audience that is looking for YOU to meet their insurance needs. Contact us to find out more about how a Michigan Radio Corporate Sponsorship can help you grow your health insurance business! Due to Medicare’s quality incentive program, treatment outcomes directly impact your bottom line. Having a well-educated, affluent patient base increases compliance, which improves patient outcome. The Affordable Care Act has increased the number of people with insurance, but many of the newly insured have Medicaid. While this increases reimbursement, the reimbursements are lower than those received from commercial policies. Michigan Radio is uniquely positioned to reach ideal potential patients with your message. Contact us to find out more about how a Michigan Radio Corporate Sponsorship can help you grow your healthcare business!